Very vigorous, prolific vine, allowing excellent fruit protection from sunburn. The round, 9 - 11 Kg fruits, mature at 80 days after transplanting. The grey shell with light green scribbling, hides a deep red crunchy flesh, and a sweet taste. 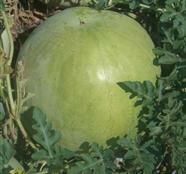 Bella F1 is a high producer of high quality watermelons.